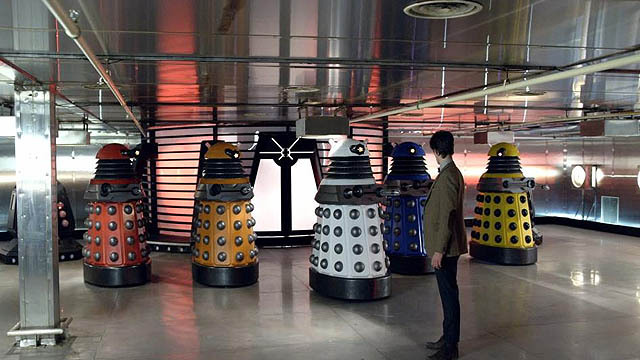 Doctor Who: Looking Back At VICTORY OF THE DALEKS | Warped Factor - Words in the Key of Geek. 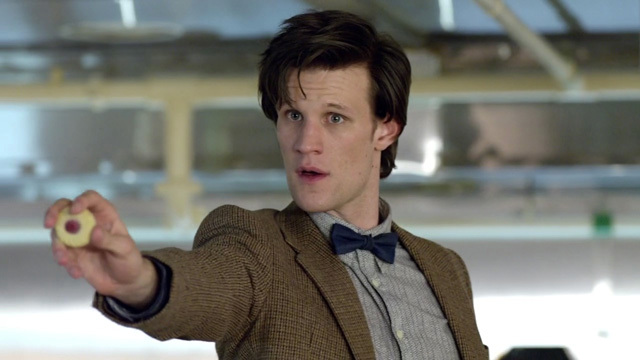 One of the most anticipated episodes of Matt Smith's inaugural season as the Doctor was Victory Of The Daleks. Penned by Mark Gattis, this episode would see the first showdown between new Doctor Matt Smith and the series oldest villains: the Daleks. Yet while anticipated, Victory Of The Daleks would receive a mixed reaction upon its broadcast. So, more than five years later, we fans are left asking the same question as we did then: was this episode a rushed “Victory”? Certainly Victory Of The Daleks covers a lot of ground. Not only is it the first showdown between the Eleventh Doctor and the Daleks, it also features an outer space battle between Spitfires and a Dalek saucer, homages to classic series Dalek stories and introduces the radically redesigned Paradigm Daleks. Sound like a lot of ground to cover in 45 minutes? Indeed it is and that's the problem. Perhaps more than any other episode of the Smith era, Victory Of The Daleks has the distinct feeling of a two-parter being crammed into a single episode. It's easy to imagine the reveal of the Paradigm Daleks and the old Daleks chanting “Hail the return of the master race!” as the cliffhanger of part one with the close-up of Smith's face leading into the end credits. Sequences such as the battle between the Spitfires and the Dalek saucer, spectacular as it is, push believability as they are set up in with just a few lines about gravity bubbles instead of a proper set-up where things are explained just a bit more (maybe a scene showing Bracewell readying the devices for example). Things never seem to get properly explained as the script rushes from point to point, as if to sacrifice plot for spectacle. Perhaps the biggest side effect of this crammed feeling is the lack of depth out of the supporting characters. 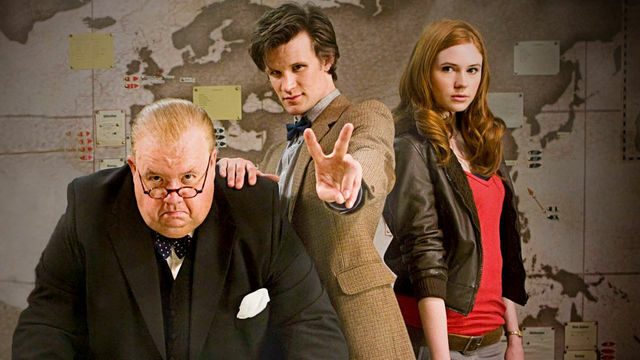 While both Winston Churchill and Professor Bracewell are both well-written and well portrayed, by Ian McNeice and Bill Paterson respectively, other characters seem to fall by the wayside into being nearly one dimensional. A prime example is Blanche Breen, the WREN in the Cabinet War Room whose boyfriend is a RAF pilot, and whose depth seems more down to the performance of actress Nina De Cosimo then down to the script. Considering the depth that Gattis brought to his supporting characters in previous TV stories, such as The Unquiet Dead and The Idiot's Lantern, this seems rather surprising to say the least. Once again, it seems almost as if the spectacle of the Daleks return overrode everything else in the episode. Which isn't to say that the episode is bad mind you. While the script might feel as though it's rushing from point to point, the performances certainly don't. In fact, if there is a single big redeeming aspect to Victory Of The Daleks it is that this episode gives Matt Smith the chance to show off his range as the new Doctor. Whenever Smith and the Daleks are on-screen together, sparks fly as Smith shows off a dark side to this new Doctor. Moments such as beating the Dalek in an attempt to get it to reveal its true self show that this Doctor, who just two episodes earlier was sitting at a table with fish fingers and custard, is a man still haunted by his enemies and maybe even the memories of the Time War itself. 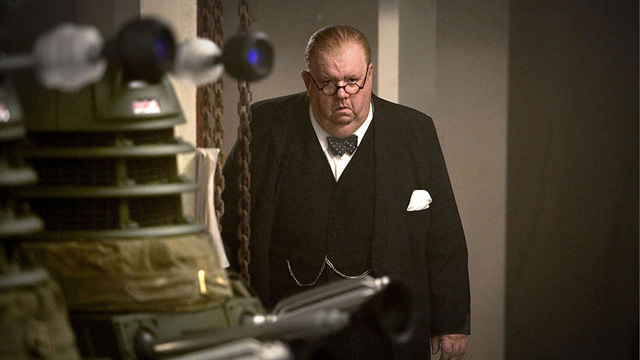 Yet Smith's best moments may well be when he is just simply reacting to the Daleks, such as the horrified reactions he gives when the Ironside Dalek is revealed or the big reveal of the Paradigm Daleks. Among all this darkness there are still chances for Smith to show off his lighter side, such as in his moments both at the beginning and end with Winston Churchill. It's Smith at the top of his game and it very much sets up the performances that were to come in the rest of Series Five. So where does that leave Victory Of The Daleks then? It has some solid performances from its cast (especially Matt Smith's still new Doctor) and some fine sequences as well, such as the reveal of the Paradigm Daleks or the Spitfire vs Dalek Saucer battle. The script by Mark Gattis though feels rushed, as it uses those spectacular sequences, rather then its characters, to keep the story moving. The result is that, being so full of those sequences, Victory Of The Daleks is an episode that feels, whether it was created as such to begin with, like two episodes crammed into one.